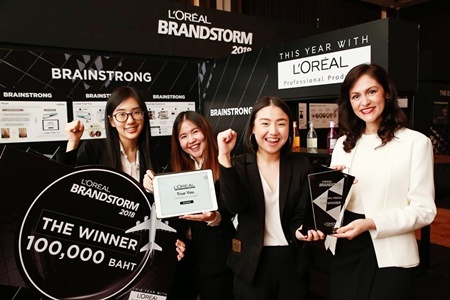 L�Oréal Brandstorm 2018 marks the 15th anniversary in Thailand. This year in partnership with Professional Product Division. The mission is to �Invent the Professional Salon Experience of the future�. With over 90 teams from 8 universities across Thailand, our team �Brainstrong� from BBA Thammasat consisting of Phantila Jindasataporn, Pemika Masana, and I, Pichapa Tiramanit succeeded in being the winning team. We will represent Thailand in the International Final round in Paris, France later this year. Our core idea is �L�Oréal True You� which are innovative software and device aiming to ensure customers� satisfaction from salon experience. Our innovation comprises of 3 elements featured Augmented Reality mirror, Near-infrared hair scanner, and a meticulous database. Moreover, we incorporated existing �Style my Hair� application by adding more features to complete the futuristic customer�s journey. The competition comprises of 4 rounds which are 3-slide PowerPoint Submission, 3-minute Pitching round, Innovation Fair, and Final Pitching Round. We were give a limited amount of time to present our ideas and address judges� questions. Moreover, with the new format �Innovation Fair� where we have to pitch our ideas to different sets of juries from every division of L�Oréal Thailand. We would not be able to come this far alone. We, hereby, would like to express gratitude towards everyone involved in our success starting from L�Oréal Thailand, L�Oréal Human Resources Team, BBA Thammasat, Asst. Prof. Dr. Nopporn Ruangwanit, Asst. Prof. Dr. Aurathai Lertwannawit, our teammates, friends, and families who have supported us along the way. Thank you.